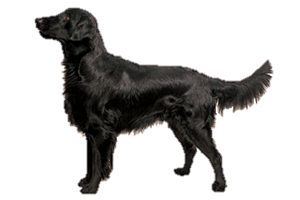 The Flat Coated Retriever is a gundog that brings back shot birds from both land and water to their waiting hunter. Although many gundogs can retrieve, the category of retrievers are more specialized at the task of finding drowned waterfowl. It is believed the Flat Coated Retriever was developed in England by crosses between the lesser St. John’s Water Dog (ancestor to the Labrador Retriever) and the Newfoundland, with setters, spaniels, and collie-types added at a later date. It quickly overshadowed the Curly Coated Retriever, only to lose ground itself to the Golden Retriever. After WWII it came close to extinction, but was saved by a handful of supporters. Today the Flat Coated Retrievers numbers remain low in comparison to the other retrievers, but stable. Is the Flat Coated Retriever Right for You?